Since its formation, MWS has coordinated volunteers who participate in the StreamWaders program sponsored by Maryland's Department of Natural Resources. Each spring, we head out to wadeable streams to collect invertebrates, such as insect larvae, that live on the stream bottom. The mix of families tell a good deal about the health of our streams. Ichthyplankton (from the Greek for fish wanderer) is a tongue twister referring to the tiny eggs and larvae that wander our streams after fish spawn. Each spring from March through May, MWS nets the eggs for the Maryland Department of Natural Resources, who identify the eggs and compile the results. Our research has found that, over time, usage of the nontidal Mattawoman by spawning River Herring has plummeted, a loss linked to watershed urbanization. Yet the most downstream collection site is holding its own, with egg densities only somewhat below historical levels. Ask any bass angler, and they'll tell you that "weeds" or "grass" play an important positive role in estuarine ecology. These underwater plants, also known as S.A.V., for submerged aquatic vegetation, provide cover for small fish, attract game fish, filter sediment from the water, anchor bottom muds, dissipate erosive waves, support snails and other tasty organisms for fish and waterfowl, and of itself are an important food for waterfowl. For example, the Latin name for the Canvasback, our largest diving duck, is Aythya valisneria, an acknowledgment its fondness for Wild Celery (Vallisneria americana). SAV also produces oxygen through photosynthesis, so fishery scientists with Maryland's Department of Natural Resources were concerned when a submerged-sensor reported low levels of dissolved oxygen (DO) after being overgrown by SAV. The Fisheries Service enlisted MWS to explore further. In 2011 and 2014, volunteers paddled the estuary around Smallwood State Park during summer months and measured water quality parameters along transects. The results showed that especially dense beds of SAV could harbor lethally low levels of DO. A possible contributing factor was large amounts of decaying filamentous macro-algae that had been growing on the SAV. The 2011 results were reported in a poster at an annual conference of the Maryland Water Monitoring Council. During the spring of 2015, MWS assisted the Maryland Department of Natural Resources by conducting trawl surveys in the estuary to detect the presence or absence of Yellow Perch larvae. Volunteers deployed a plankton net (left photo) and trawled it for a timed period at ten sites along the estuary. They washed the contents of the net into a mason jar (middle photo) and examined the jar for yellow perch larvae (right-hand photo). Water quality parameters were also recorded, and selected samples preserved for later analysis. Yellow perch larvae were present in all samples, suggesting a good spawning run and egg viability. But it's not over yet in the gauntlet of survival, for the larvae must find enough tiny zooplankton to eat, and that requires a healthy upstream watershed. Most folks know to get out of the water during a thunderstorm, or that making toast while taking a bath is bad idea. That's because water conducts electricity. 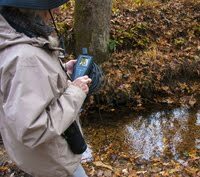 This monitoring study determines just how well the water in Mattawoman Creek and its tributaries conduct electricity. The study is carried out in collaboration with fisheries scientists in Maryland's Department of Natural Sciences. The ability of water to conduct electricity is measured through a quantity called the conductance or conductivity. The conductance depends mostly on the amount of various mineral salts in the water. A familiar and relevant example is table salt, or sodium chloride. When salt dissolves in water, sodium and chlorine atoms separate, with the sodium carrying a positive electrical charge and chlorine a negative charge. In these charged states, the atoms are now called "ions." When ions move, they carry current. Road salt is also usually sodium chloride. In urban areas, road salt washes into streams that can be detected as an elevated conductance. In fact, our studies show that elevated conductance in Mattawoman Creek and its tributaries streams is correlated with road density upstream. Preliminary results of the conductance study were reported in a poster at the 2015 annual conference of the Maryland Water Monitoring Council.